So I’ve long been promising an insight into what I’ve been working on lately. But first a bit of background: Langstead Junction is on hold. The reason for this is two-fold. Firstly it’s to help me save a bit of cash and post-christmas is always the ideal time in the year to do this. Secondly, I’ve got the stage where Langstead Junction has developed as far as is technically possible within the realms of space and design. I’d really like to start a main layout again from scratch, and put right many of the design flaws that I built into Langstead Junction without better knowledge. I’d like to run longer trains, concentrate on scenery to a higher standard and maybe convert my stock to DCC. As you can probably tell this isn’t going to be an overnight change. It also slightly negates the first point: Save Money! I’ve spent the last 3 months considering my options and I’m still none the wiser in how I’d like to design a new layout. But that’s OK. I want to make sure I get it everything absolutely right and to my liking this time. This is not to say Langstead Junction is ‘wrong’ by any means. Langstead Junction has (and continues) to serve me well for the enjoyment of running trains. However it’s now come to a time where I’m considering how this all looks and operates atheistically and through all that I’ve learnt on Langstead Junction, I now feel that I have the required skills to do better. So whilst I ponder over making a new layout a reality (and wondering what to actually do with Langstead Junction when time comes to move or sell it), I need something small and cheap yet challenging to keep me occupied! Welcome to Norton Folgate Sidings! 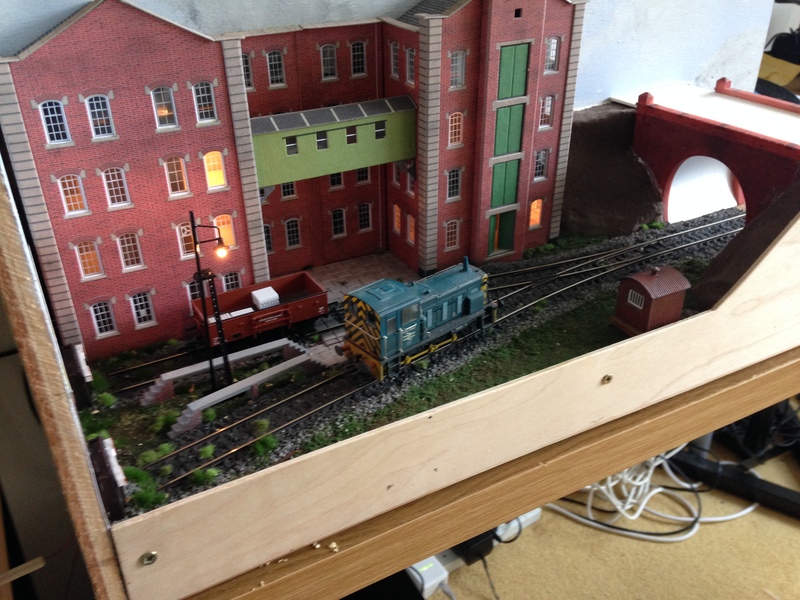 Inspired by Ingleton Sidings, the model measures just shy of 77cm x 22cm (The scenic portion is 54cm x 22cm), and I’d best describe it as a fully functioning diorama rather than a layout. 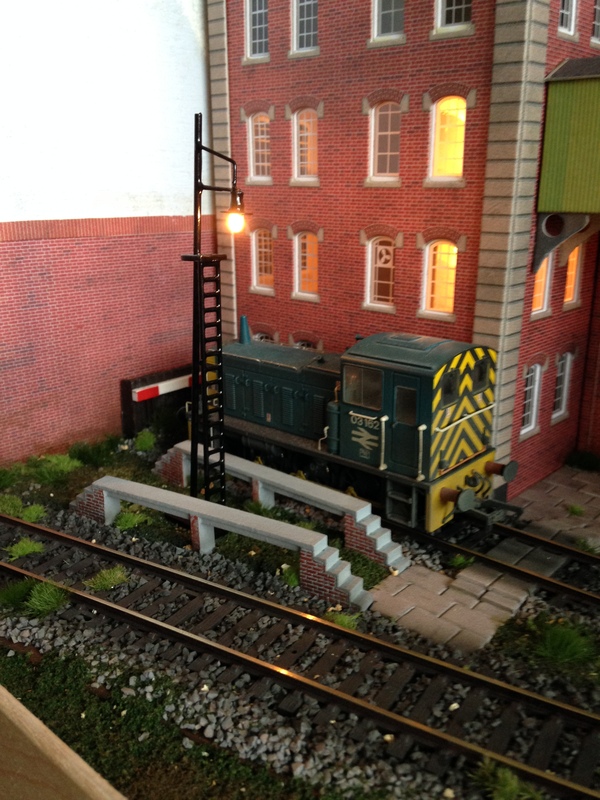 It’s in my scale of choice (OO) and features two short sidings and a two track slider-based fiddle yard: both capable of hosting a shunting locomotive and one small wagon. 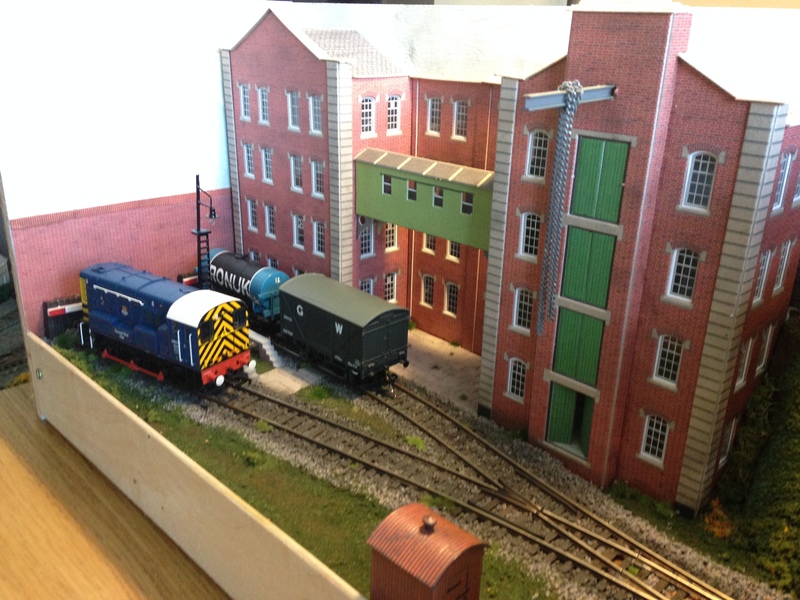 At the heart of the diorama is the Metcalfe factory kit. Very popular and very common, but it fit perfectly into the space I had to work with. The bridge to the right is from the Hornby Skaledale range and I’ve used plaster cloth to model the banks leading up to it. The layout is (at present) DC, but does feature working lights and my first attempt at weathered track (which I’m rather pleased with by the way!). 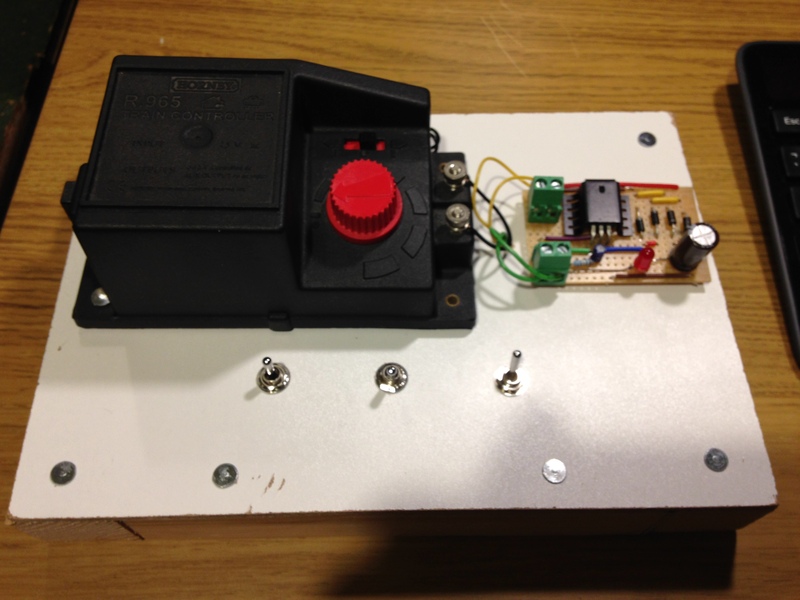 In terms of power supply, I’ve build myself a temporary control module out of the classic Hornby Set Controller. It’s not great, and I’d like to upgrade to a Gaugemaster Combi, but in the meantime it’s doing me just fine. The circuit board to the right converts the 16V AC accessory output to 12V DC for the lights. Underneath the white shell, there is a Capacitor Discharge Unit by Gaugemaster and a Peco PM1 Point motor to control the turnout on the diorama. I’m choosing to base the diorama in mid 1970’s East London. Specifically in the Liverpool Street-Shoreditch-Bishopsgate Goods Yard area. I realise the later burnt down in 1964, but I’m allowing for a little artistic licence. I also realise that vivid Red-Brick buildings in London are fairly rare. Unfortunately that’s the colour the kit came in and I didn’t fancy scratch building one from Yellow Brick paper. My decission for location and era was more based on the locos I wish to run. I’ve got at my disposal two BR Blue shunters, a Class 03 and an 08. (The 08 is Invicta Rail’s limited Liverpool St Pilot edition – hence the tenuous location link!). I’ve also got a London Transport Pannier tank loco, which could be living out it’s final days shuffling wagons around my yard. The name Norton Folgate is derived from the rough area of the same name near Shoreditch (as bellow). The sidings could exist anywhere within the shaded area, providing mainline access to my warehouse. 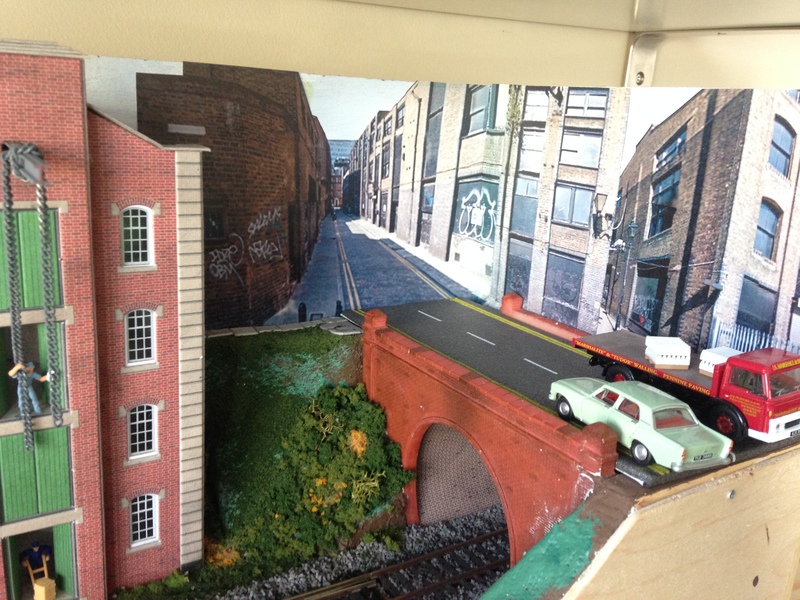 I’ve even gone as far as using images of nearby Blossom St To act as a backdrop to the layout. I’m not quite sure the double perspective works but I think they blend in sufficiently well. I won’t bore you with the details of how I got this far with the model. I think I extensively cover things like Ballasting and Scenery all within the development of Langstead Junction and Salford Chapel. I will however begin to focus on and draw your attention to adding finer details. I would really like to exhibit this one day!